DiabloFans Barbarian builds => Enter the item's name under "Has Item" and hit "Filter"! 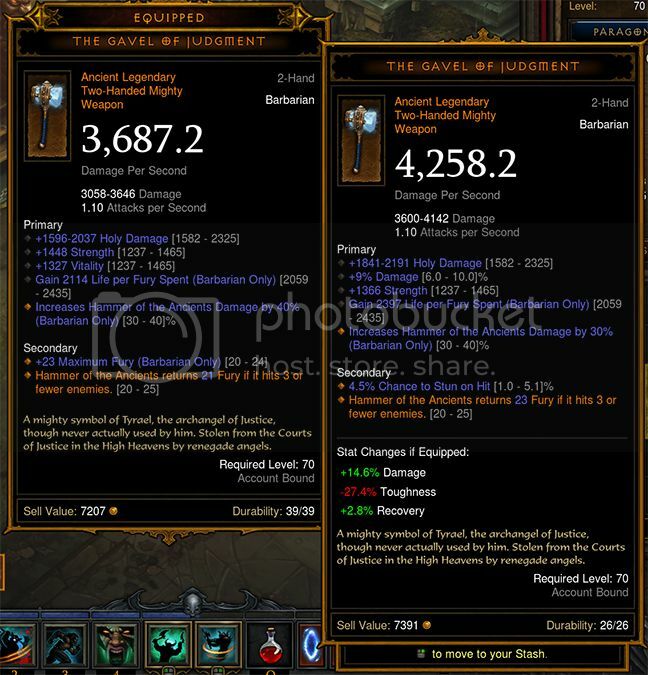 Hi, can you guys help advice on what to reroll on this Gavel of Judgement? I imagine the two choices are either attack speed to life per fury spent, or rerolling the average damage to a better roll... Assuming I rolled LPFS on belt & bloodthirst passive what would be the best route with this, more damage or more healing? Could someone help me what would be the best to reroll? Im 99.9% sure you get more damage from going to about 1900ish to 2400ish instead of getting 2% more dmg. 6-7% damage reduction for sure. That's an insane chest, man. @Fitsu: Hard to tell, I think there's no perfect option. Re-rolling IAs, vitality, or the damage range are all viable options imho. It's a nice one for sure, but unfortunately not perfect, and with the cube you should be able to get a better one in the next few months... so don't stress yourself out about it and go by gut feeling. I'd probably re-roll the IAS; I don't like re-rolling damage range since it locks you in and you can't switch to another stat later; and vitality is awesome for everything, it's a lot of vit, whereas IAS is not one of the top stats for HotA (afaik). Pickup to ranged damage reduction I'd say. Or melee... but definitely either of those two. What stat would you reroll? I presume you should roll Vita to % dmg. However i am not sure how crucial LpFS is. And what about reroll the dmg? Moved to the re-roll thread. In the first post there's a link to a tool which let's you calculate whether re-rolling perfect damage or damage % will yield more DPS. If you don't care about solo you might also just roll LFPS to damage % since you don't need that (the monk will heal you), but in solo it's good to have on weapon. geez. tons of gavel posts. Here's another! I'm can't decide which to use. On one hand I have lower average damage but high HoTA bonus. On the other hand I have higher average damage but low HoTA bonus. Which would you choose and how would you roll it? The one on the left is better in my opinion. I totally agree. The extra 23 fury also provides 6% CHC using the HotA skill which is even more damage. However, none are ideal imo. For the time being go for the left and 10% Damage but re-roll the life per fury and not the VIT. If I rerolle Base DMG to max, I will have 3996.3 DPS. Should i reroll the 19% phys damage for crit damage? I'm running Whirlwind barb. Usually my reply would be STR to CHD, but then I've heard that due to using CoE the physical damage isn't that useful, so your intuition would also be fine. Plus, if you re-roll physical damage you can use this for any element. However, as soon as you stop using CoE the physical damage is much much better than STR in any case. Well, tough choice. Wait for other replies. What would you re-roll, using hota build. Guessing life per got but to area damage or 10% dmg or what? Btw I solo play 98% Of the time and currently run ww with ignore pain so I'm not sure about surviablity with this build was waiting for ancient wow before switching builds.